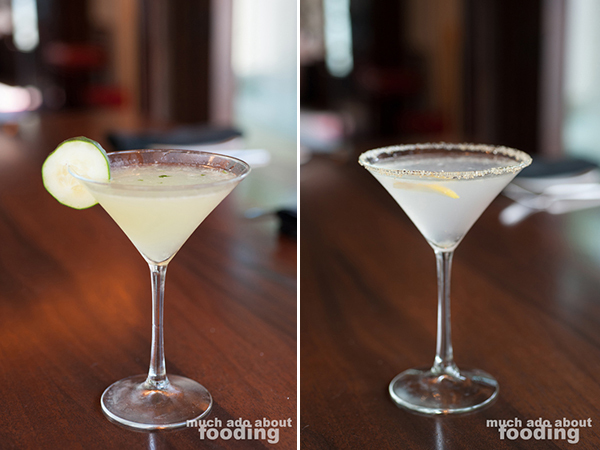 It is not often that one comes across a restaurant that serves Indian cuisine in a fine dining setting. Often presented cafeteria or buffet style in Orange County, Indian food is a stranger in these parts to the white cloth napkins and waiter service of other cuisines. I can name just a few approaching it this way, and one would be Tamarind of London. I had first heard of Tamarind when they won a Golden Foodie Award a few years ago and then seen them upon visiting Sweet & Saucy Shop in the Crystal Cover Promenade. A sister restaurant to the Tamarind of Mayfair in London, a Michelin-star restaurant, Tamarind of London follows the same philosophy to fuse together authenticity with accessibility. The menu is varied with strong focus on hitting multiple regions of India to demonstrate the diversity of the regions' styles. We were invited in one afternoon to get a glimpse at what this artfully decorated and laid-out restaurant was all about. Aside from the intimidatingly large door out front, the first thing we noticed about Tamarind of London was how posh yet inviting the interior looked. Well it ought to since it cost the restaurant group $4 million to outfit the space in such a way. The heavy use of wood gave an outdoor feel to the place while the chic reds, browns, and yellows brought you back into an indoor mood. I especially admired how the clay tandoors made in India were stylized externally to be able to be displayed to clientele who could peer into the open kitchen and see what's cooking. The original Tamarind came to be after the owners could not find a beautiful and well-done Indian restaurant in London after moving there; they decided to design and build their own, hiring chefs from India and placing themselves into the fine dining realm. Though it took three years to find footing and acceptance for its unique concept, Tamarind flourished by using good products (for which prices were matched) and became the first Indian restaurant in the world to receive a Michelin star. The origins of Orange County's own Tamarind is similar - the Indian food in the area did not meet the standards and vision that the owners had. 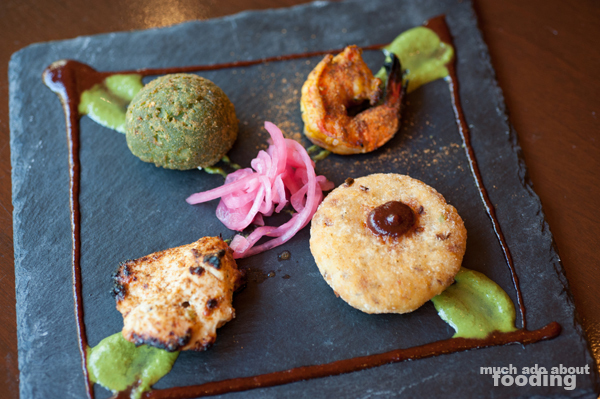 "We want to teach people about Indian food and bring the cuisine up a notch. The servers need to know as much as a French restaurant staff would know about the food so we really train our staff on herbs and where things come from." 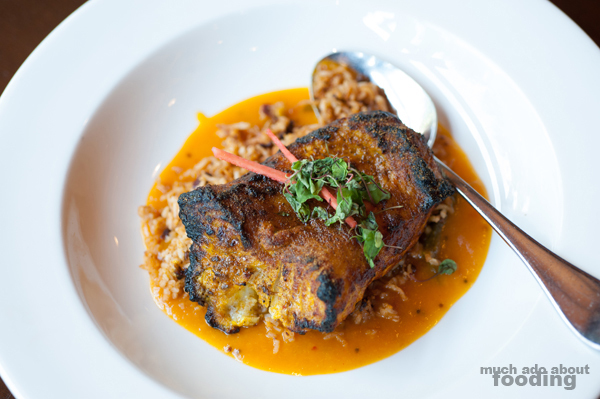 Tamarind's chef, Imran Ali, is self-taught but has worked in Indian restaurants since he was 17. Though he is Pakistani, the passion for the food shone through as he made his way from dishwasher to busboy to sous chef and then to full-fledged chef. Every year, he returns to India and Pakistan to learn more about the cuisine from others there including his own family members. With all of the stewing and marinating that goes into the food, it is necessary to be very mindful of how ingredients affect one another. In regards to the various regions in India which produce vastly different styles of food, Chef Imran picks from each with dishes in mind that fit his own style as well. Because of the audience here in Orange County, there is always an element of plating with more vibrant colors whether in ingredients or plates to combat the food's typical earth tones. "We will always do family style and never buffet because that's what we represent - people sitting together and having fun." So when I had first heard about Tamarind of London, it was for their cocktails. These run at $14 apiece but are nicely balanced and presented in an assortment that can please varying palates. My first try was their namesake Tower of London made with gin, Chase Elderflower, freshly muddled cucumber and basil, fresh lime, and simple syrup. Bright and refreshing, this cocktail had the lovely herbaceous flavors of gin without being overpowering, giving enough cucumber and basil notes to come through to present a fair balance. My second drink was another namesake, their TOL Manhattan made with Benchmark Bourbon, Chase Elderflower, and sweet vermouth. Strong on the bourbon (as Manhattans can be), the cocktail was slightly sweeter than I had hoped but a fair interpretation of the classic drink. 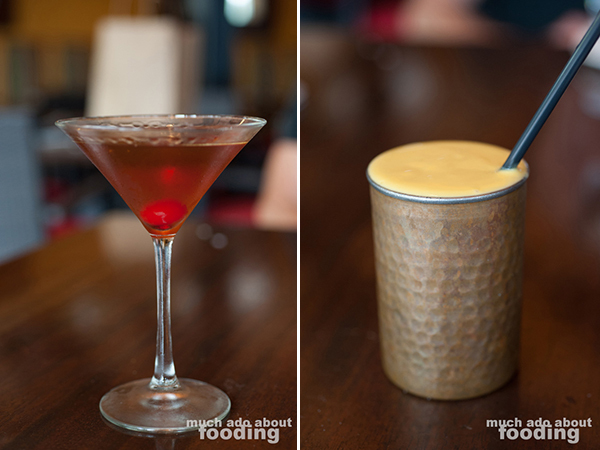 We also tried their Mango Lassi ($6) that came in an attractive hammered-copper cup and was a thick, smooth drink, one of the better lassis I've had the pleasure of having. The menu itself for food was organized in a more familiar fashion to clientele not accustomed to Indian menus, focusing on sectioning off dishes by their function during the meal and proteins (instead of method of cooking). Every quarter, Tamarind rotates some of the dishes on the menu to follow the seasons and give people a reason to come back. 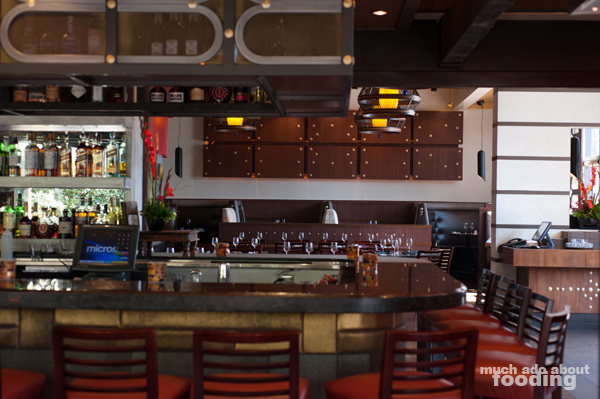 For those who are new to the cuisine, the staff always suggests a few favorites and runs through the menu with them; education seems to be an important part of the restaurant's goal as they bring the food into fine dining. In terms of sections, there were Small Plates ranging from $13-$19 and then the rest were split into their proteins such as Poultry & Meat, Vegetables & Paneer, and Fish & Seafood, complete with wine pairing suggestions. The prawn and chicken were both done in the tandoor without butter, cream, or oil; they were just heated in their own marinades, producing an evenly-cooked and well-flavored product. I especially enjoyed the hara bara palak kofta because the potato was so smooth and spinach so distinct. 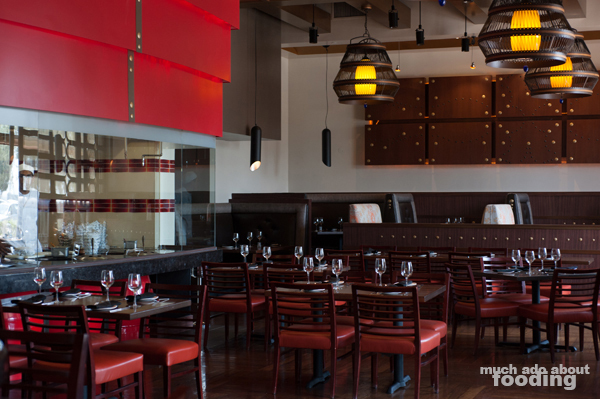 Have you found that Tamarind has become a desintation spot? "For Indians, it is. We've had West Covina and Glendale people just come because they had heard of it in London. It is a strange location because we're between Newport Beach and Laguna Beach but we do well. There are a lot of guests from the nearby hotels and international travelers including royalty such as princes." 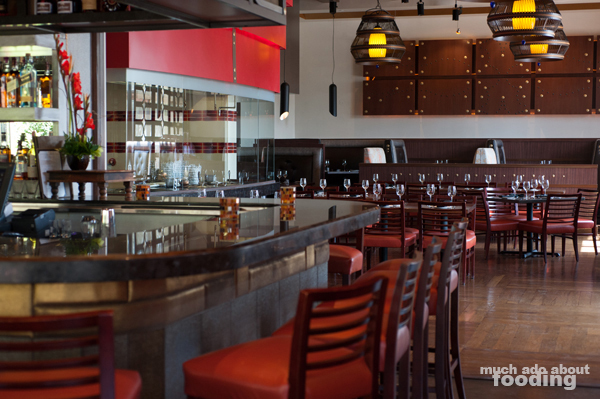 We were speaking that afternoon with Dario, Director of Catering, about all of the food and the restaurant's history; he divulged to us that they were aiming to make Tamarind a distinct place for everyone. While 70% of their clientele seems to be Indian in ethnicity, more outside of that realm need to be educated to visit. Perhaps it just takes more sharing of their food! We went for entrees next, shared family-style of course. The first up was their Saffrani Machi (Tandoori Seabass): $29 - charbroiled Chilean Seabass with saffron-ginger green chili marinade and apricot curry sauce over Indian risotto. I don't think you would even need to tell anyone that saffron was incorporated into the dish once you saw the telltale yellow hue and smell the spice's fragrance. Cooked in the 1000° tandoor for a mere 72 seconds, the seabass is adorned with a beautiful brown, having been marinated in spices. It was tender and juicy upon its bed of Indian rice and certainly a dish for the fish lover who needs some subtle spices with his/her seafood. 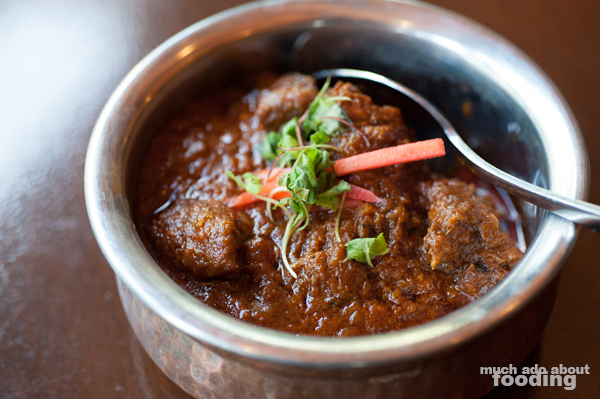 Our second entree was the Kashmiri Lamb Roganjosh (Classic Lamb Curry): $27 - lamb slow-cooked with browned onions, tomato, and Kashmiri red chiles. Dario explained that the sauce itself takes more than nine hours to prepare. It first cooks for five hours before being placed overnight in the refrigerator to marinate; then the lamb is added and cooked for another four hours. The popular of the dish requires it to be made every other day, and I can see why. Rich and hearty, it is akin to the too-familiar beef stew of many other cultures when it comes to comfort food. Not quite the best lamb curry I've ever had, the dish was still able to hold its own. 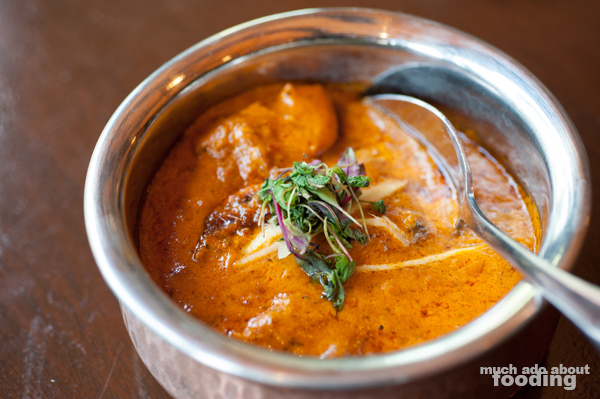 The next dish to come out is a familiar favorite of people who frequent Indian restaurants - Murgh Tikka Masala (Chicken Tikka Masala): $26 - chicken breast tikka in Makhni sauce with sauteed onions and dried fenugreek leaves. I'll admit that this was possibly my least favorite of all the entrees we tasted though because the chicken was a bit overcooked and the flavors muted. 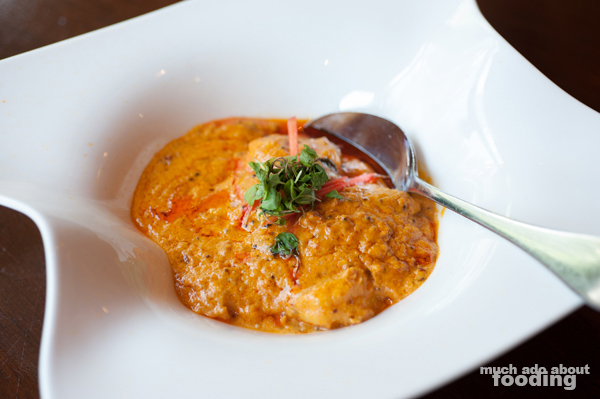 However, the Dakshini Jhinga (Coconut Prawn Curry): $28 - jumbo prawns in a traditional sauce flavored with ginger and coconut milk, easily made up for the previous dish. This was my favorite of what we tasted that afternoon because the prawn were lusciously large and sea-sweet. The curry was rich and silky, consumed with swiping pieces of naan, and the coconut milk helped bring that texture across more so than the other curries. The only complaint with this particular dish was that it was gone too soon and served in too small of a portion for me. "Come and eat. Have fun. The proof is in the pudding." 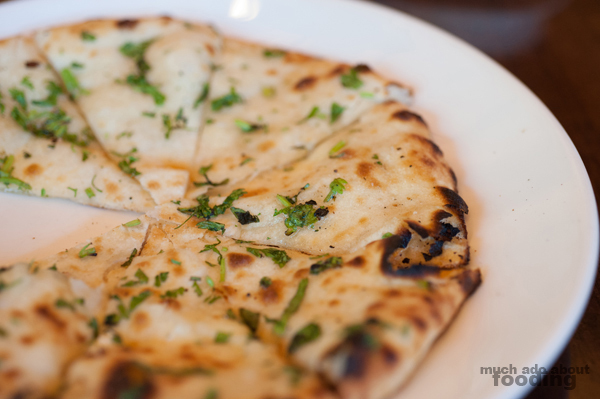 Dario was not shy about his own love for the food and how it is, to him, the best Indian food in Orange County. 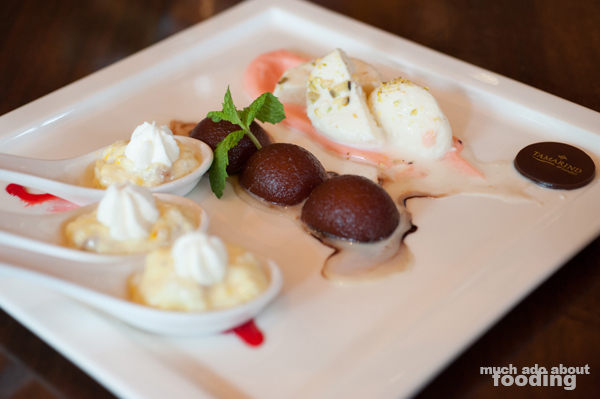 Our next test of this was their dessert platter which came out featuring very common Indian desserts instead of any type of fusion menu. There was Ras Kheer (rice pudding) in spoons, Gulab Jamun (milk dumplings), and Ras Malai (soft sweet cheese), all typical offerings for the culture. As a generalization of these types of desserts as a whole, they run too sweet for me, and Tamarind of London fell into this categorization as well save for their Ras Malai which had just enough rosewater to prevent the sugariness to take over. Otherwise, the others were fantastic in texture and ease of eating but seemed overpowered by their sweetness. To verify the authenticity of the cuisine would be presumptuous on my behalf because I do not know what constitutes as authentic Indian food or not. What I do have to note is that these entrees that we tried were certainly not as heavily spiced or flagrantly fragrant as other restaurants we've been to serving Indian food. That may be a preference point for some. We also noticed a lack of heat/spiciness that some places have and perhaps that is a good thing. If you are looking for a fine dining experience for Indian food, then you might want to look here as they do take care to use ingredients of higher stock but if you are just trying to satisfy a craving for rich, creamy, and hearty without pulling out too much from your wallet, we've got plenty of other suggestions. That being said, you can find Tamarind of London at 7862 E Pacific Coast Hwy in Newport Beach right in the Crystal Cove Promenade.